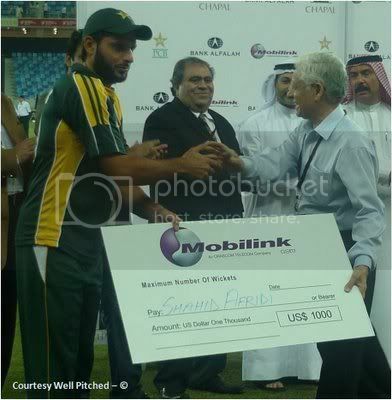 It was Shahid Afridi's Day! Pakistan could not have asked for a better start to the series. 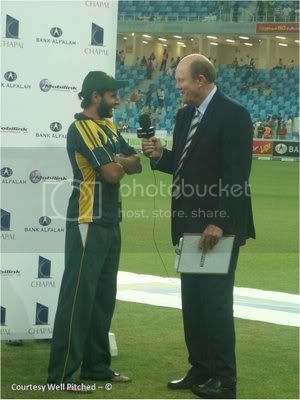 Plus, Shahid Afridi could not have asked for a better way to prove Intikhab Alam right. What a match Afridi had. 6-38 was not only his best bowling effort in ODIs but also the best bowling effort by a Pakistani against Australia in the history of ODI cricket between the 2 teams. To top that he played a little cameo innings as well. A very typical Afridi innings for that matter. It wasn't a surprise then that he dominated the post-match presentation just the way he dominated the Aussies and the match. Here he shares the secret of his bowling with Ahmed Shahzad and waits to be called up, not once, not twice, but thrice to receive a prize. Here he is receiving his first. Something about hitting a board that made him richer by a 1000 dollars. Another 1000 bux for picking up the most wickets in the match. 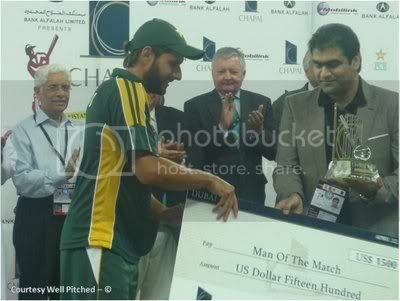 And ofcourse the man of the match award. Speaking to Tony Greig, he talked about how Intikhab Alam and Abdul Qadir have helped his bowling and how he's looked to improve as a bowler. 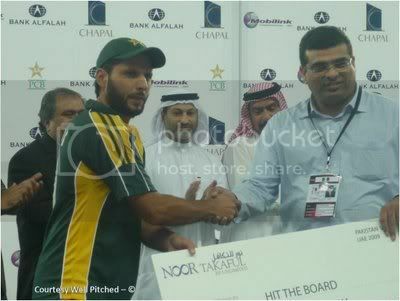 It was surely an extraordinary bowling performance from Afridi yesterday. I have never seen him turn the ball so progiously, and never have I seen him bowl the googly so well. Not bad to be a leg spinner when you have one as a coach and a chief selector! As for what I was doing at the post-match presentation? Being a part of the media management team, I was responsible for leading the photographers on and off the ground and making sure they remained in their positions. I had a couple of security guards to help me, which allowed me a few clicks. BOOM BOOM IN DA HOUSE ! Awesome Afridi! Mark my word, lack of quality spinners in Australia's domestic cricket would plague them for years to come. Keep up the good work Pakistan! He rocked the house yesterday Maza! Thats exactly what Waqar Younis said Som.